Pre-heat oven to 450 degrees. 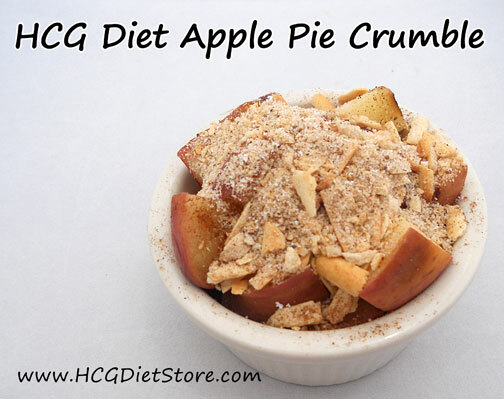 Prepare this recipe by cutting the apple into 1/2-inch size pieces, removing the core and seeds. Toss the apple pieces with cinnamon, place in a small over safe dish like a ramekin or soufflé dish. Pour the water into the bottom of dish. Place in oven for 15 minutes. While the apple is in the oven, mix grissini powder, stevia, and cinnamon in a small bowl. Once the apple is done, top with this mixture, enjoy warm. This Hrecipe is allowed on the VLCD phase of the diet (also known as Phase 2 or the 500 calorie phase). This recipe equals 1 serving of ‘carbs’ and 1 serving of fruit.